The interaction between tradition and creation is not a mere style or figure. it is inherited in a conservative, eclectic and confrontational manner. whether at the scale of a garden, a city, or a country. with the living system. It is nothing more than a fake piece of landscape and nature. all of our senses and our mind’s eye. 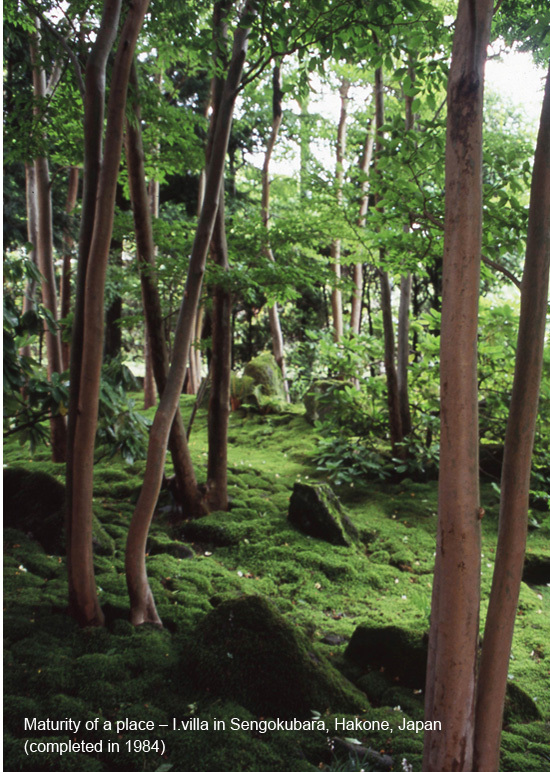 When our landscape architects design a place, we apply the key landscape, the local materials such as trees, stones and other materials associated with the region, and the local traditional technique as a symbolic representation. We believe that this clarifies the sense of place being unique, different from anywhere else. associated with each period of the year. insects and water running along a stream. *kakehi: [a garden feature] a bamboo pipe that makes sound when water trickles from the pipe into a basin. 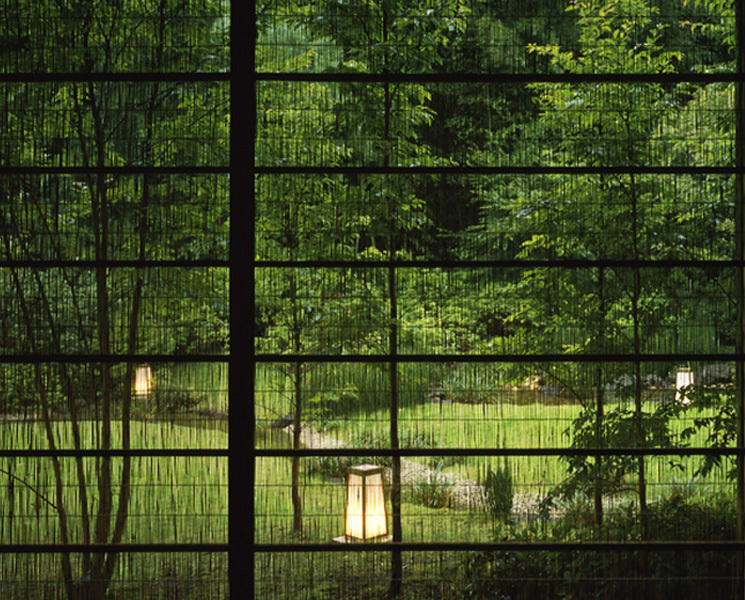 **suikinkutsu: [a garden feature] a buried earthen jar that makes a sound when water drips into it. The world of sound is an extension of the sounds that we heard in the mother’s womb. What most vividly evoke distant memories are life experiences through the medium of sound. Such familiar sounds are messages from nature and the landscape, and they constitute pieces of information. and tells us of invisible events occurring in the immediate environment. capture the interest of people. anyone seeing it for the first time. where Gaudi was brought up, the forms seem less incongruous. the vertical natural form of the forest in the suburbs of Barcelona. 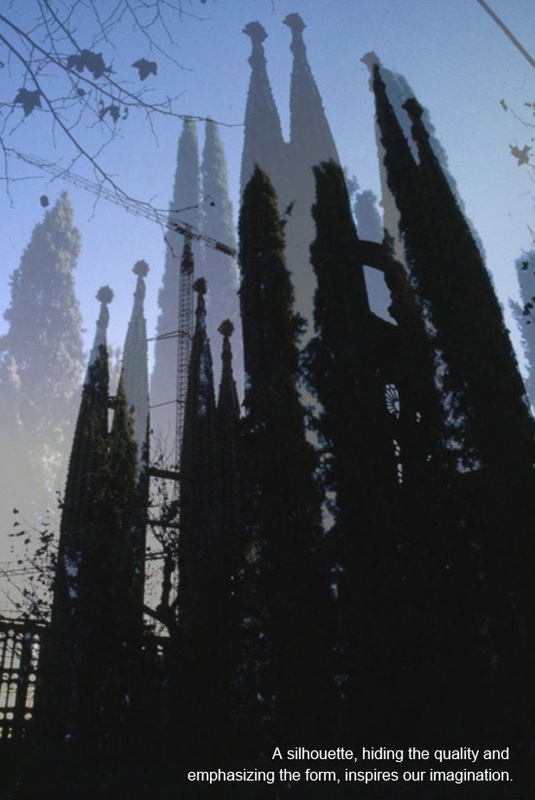 Sagrada Familia – it is probably a symbol of the God which Gaudi was trying to represent as a likeness of the forest. When passing through a landscape, people memorize the features of the landscape through repetition and comparison of the figure and the ground. This is the effect of actual experience. Forms can be seen as somewhat nostalgic, or having a resemblance to something in the context of the experience of the viewer and the surrounding landscape. Therefore, it is strange to make forms and imitations without the meaning and inevitability. As we learn from the earth and cultivate our mind, we have gained knowledge and intelligence from nature and on-site works, and we have reflected ancient wisdom in our designs and methods of growing plants. Therefore, we have to spend as much time and energy as possible on making preliminary studies so as to broadly assess the conditions of a site before actually beginning to develop a project. Having done that, we must also be ready to look at the core element of a scheme – not only for what it is, but also as a way of orientating it in relation to its surroundings. In some cases we need to be moderate, in keeping with the sprit of not creating without careful consideration. In the field of Landscape Design, things not only at a visible level but also at an invisible level have sincerity, contentment and spirit which can affect people emotionally, and lead people unconsciously into a kind of comfortable paradise. We will continue to be particular about forms in Landscape Design, and actualize them on the earth as our canvas, while also refining what we do. Having done this, it is time to sit back and watch how a scheme matures with the passing of time.